^ a b 原色・原寸世界きのこ大図鑑『Amazon』東洋書林、2012年、7頁。ISBN 978-4-88721-799-7。 The Book of Fungi, 2011. ^ 宇田川俊一・椿啓介・堀江義一・箕浦久兵衛・渡辺昌平・横山竜夫・山崎幹夫・三浦宏一郎、1978. 菌類図鑑（上巻）. 講談社サイエンティフィック、東京. ISBN 9-784-06129-961-0. ^ Gaston Guzmán, G., Bandala, V. M., and L. Montoya, 1990. 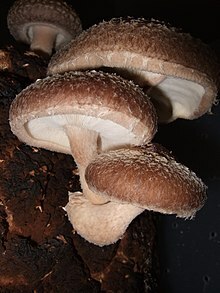 A comparative study of teleomorphs and anamorphs of Pleurotus cystidiosus and Pleurotus smithii. Mycological Research 95: 1264-1269. ^ 日本菌学会（編）、1996. 菌学用語集. メディカルパブリッシャー、東京. ISBN 978-4-94410-900-5. ^ Takaki, Koichi, et al. (2009). “Improvement of edible mushroom yield by electric stimulations”. Journal of Plasma and Fusion Research Series 8: 556-559. http://www.jspf.or.jp/JPFRS/PDF/Vol8/jpfrs2009_08-0556.pdf. ^ Lazo CRM; Kalaw SP; De Leon AM (2015). “Ethnomycological Survey of Macrofungi Utilized by Gaddang Communities in Nueva Vizcaya, Philippines”. Current Research in Environmental & Applied Mycology 5 (3): 260. http://www.creamjournal.org/PDFs/Cream_5_3_8.pdf. ^ Maser, Z., Maser, C., and J. M. Trappe, 1985. Food habits of the nothern flying squirrel (Glaucomys sabrinus) in Oregon. Canadian Journal of Zoology63: 1084-1088. ^ Ure, D. C., and C. Maser, 1882. Mycophagy of red-backed voles in Oregon and Washington. Canadian Journal of Zoology 60: 3307-3315. ^ 村田義一、1976. ネズミの食べたキノコ. 日本菌学会会報 17:85-87. ^ 現代菌類学大鑑『Amazon』共立出版、2016年、78頁。ISBN 978-4-320-05721-0。 21Century Guidebook to Fungi, 2011. ^ トゥーサン＝サマ 1998, p. 455. ^ トゥーサン＝サマ 1998, pp. 52-55. ^ Aleem E (Jun 2013). “β-Glucans and their applications in cancer therapy: focus on human studies”. Anti-Cancer Agents in Medicinal Chemistry 13 (5): 709–19. doi:10.2174/1871520611313050007. PMID 23140353. ^ Patel S, Goyal A (Mar 2012). “Recent developments in mushrooms as anti-cancer therapeutics: a review”. 3 Biotech 2 (1): 1–15. doi:10.1007/s13205-011-0036-2. PMC: 3339609. PMID 22582152. https://www.ncbi.nlm.nih.gov/pmc/articles/PMC3339609/. ^ トゥーサン＝サマ 1998, p. 56. ^ “Mushroom as a product and their role in mycoremediation”. AMB Express 4: 29. (2014). doi:10.1186/s13568-014-0029-8. PMC: 4052754. PMID 24949264. https://www.ncbi.nlm.nih.gov/pmc/articles/PMC4052754/.